Anyone who's played WFB (and a few other games) should be familiar with the idea of a "fallen giant" and it's potential impact (haha) in the game. GW has even previously released a 3D plastic fallen giant template, to help graphically determine how many potential casualties one may cause. I have barely started painting the first of my Big April Challenge giants. I'm starting with the Marauder Giant, and the Colossal Skeleton, if you're curious. The former is photographed below. 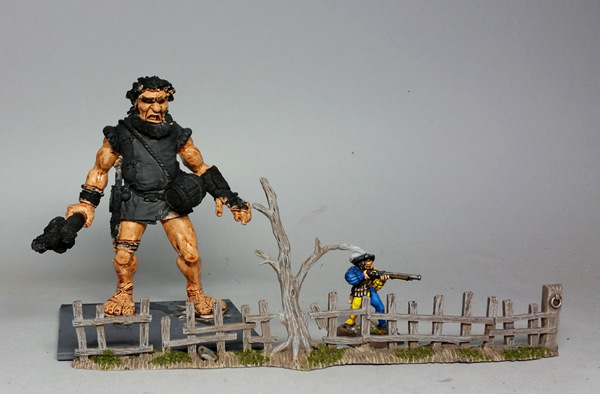 I photographed him with a section of fence, and my usual scale reference model. Obviously, I get the idea of a giant stumbling or collapsing dead onto a tightly formed unit of troops. But I started thinking... what then? Most of the time, in game terms, the body just disappears. But that's a hell of an obstacle. Now I'm thinking about creating a couple of large scale corpse terrain pieces. Presumably other large critters would leave equally large corpses behind as well. I've already been on the hunt for this cheap(ish) vinyl toy for other purposes, but I think it will also serve well as the basis for a fallen giant marker/terrain. I see if I can get one of their dragons, or similar, when there is a good sale/coupon. I still need to locate the cyclops -- all of the stores around here have been out of stock on that one for as long as I've been looking, and they seem to have an irregular restock policy.